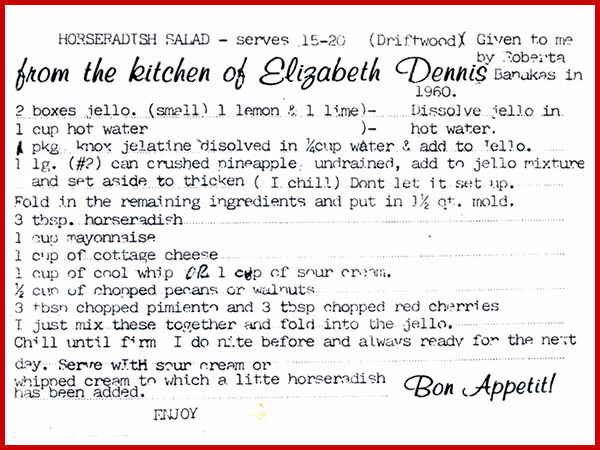 Here's the recipe for the horseradish, pineapple and lime Jello salad from Pensacola's legendary, but long-gone, Driftwood Restaurant. This is my favorite prepared horseradish it's made by Silver Spring Foods, Inc., Eau Claire, Wisconsin. Using a large bowl add the 1/4 cup of water and sprinkle the unflavored gelatin into the water, let stand for 3 minutes. add the lemon Jello and the lime Jello and one cup of boiling water. Stir until all the gelatin has disolved, three to five minutes. Add the can of undrained pineapple and chill until it starts to thicken. Meanwhile using another bowl, mix all the other ingredients and then add this mixture to the slightly thickened Jello and pineapple. Mix well and pour into a 9" by 13" baking dish or a 7- to 8-cup mold. Cover and chill three to four hours or overnight. Mix well, chill and serve this alongside the salad. Or spread it on top like frosting. Actually you have two sets of recipes here -- the first is my adaptation, the second is the Driftwood Restaurant's official version. The only changes I made were to add more pecans and horseradish and to make the salad itself a little less sweet. Here's how I got the recipe. The Banakas family owned and operated the Driftwood Restaurant in downtown Pensacola for many years. Joan Daughdrill gave me this recipe. She got it from her friend, Elizabeth "Libba" Dennis. Roberta Banakas of the Driftwood gave it to Libba in 1960. It's a family favorite with roast turkey and Cajun fried turkey. I am sure it would be great with roast beef as well. It is always a hit at family dinners. Regarding the horseradish, I personally think the best bottled horseradish is what you find refrigerated in your market's dairy case. 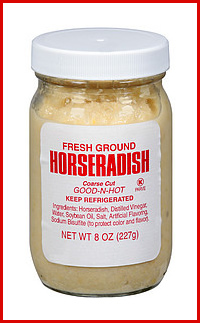 The canned horseradish, usually near the mustard counter, that doesn't need to be in the refrigerator section can be harsh and unpleasantly bitter. I use a lot of horseradish in this salad. You should, too. Above is a copy of Libba's original recipe given to her in 1960 by Roberta Banakas. I don't understand the choice of "Cool Whip or sour cream." However another Pensacola version of horseradish salad includes sweetened condensed milk. So perhaps some folks enjoy more sweetness with their horseradish. I don't add any Cool Whip or condensed milk. Copyright© 2011 Kenneth Young. All rights reserved.